Growing up, I lived in Birmingham during some of its most tumultuous years. Through it all, I loved the place and was a vocal advocate for its potential to anybody that would listen. I find that most Birminghamians across the board seem to be a loyal bunch even as we recognize the challenges. The last time I lived in Birmingham in the early 1990s, the movement toward developing city center living and lofts was being discussed even as the discussion was being met with skeptical smirks. I was an advocate for downtown living and hoped to be a pioneer in downtown Birmingham loft living but my career track had other ideas. 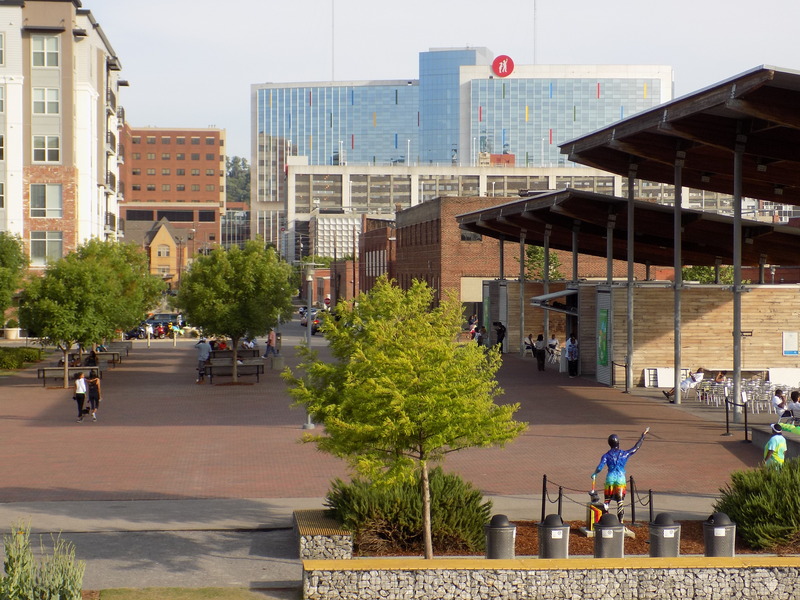 Birmingham is now in the midst of that long-anticipated renaissance as it is touted as a food destination, as it boasts more public green space per capita than any other American city, as it is competing successfully for new development, and as it aggressively restores long-neglected buildings and properties. Birmingham’s central district is divided into north and south by railroad tracks that run through the center of the city. The financial district and the historical downtown are north of the tracks and the medical center, UAB campus, and Five Points South entertainment districts are south. For many years the area next to the railroad tracks was a no man’s land of broken concrete and chert, poke sallet and weeds. In 1910 Railroad Park (www.railroadpark.org) opened as a 19-acre green space with trees and lakes, numerous paths and recreational areas, a food area and performance space, and nine acres of open, sloping lawn. 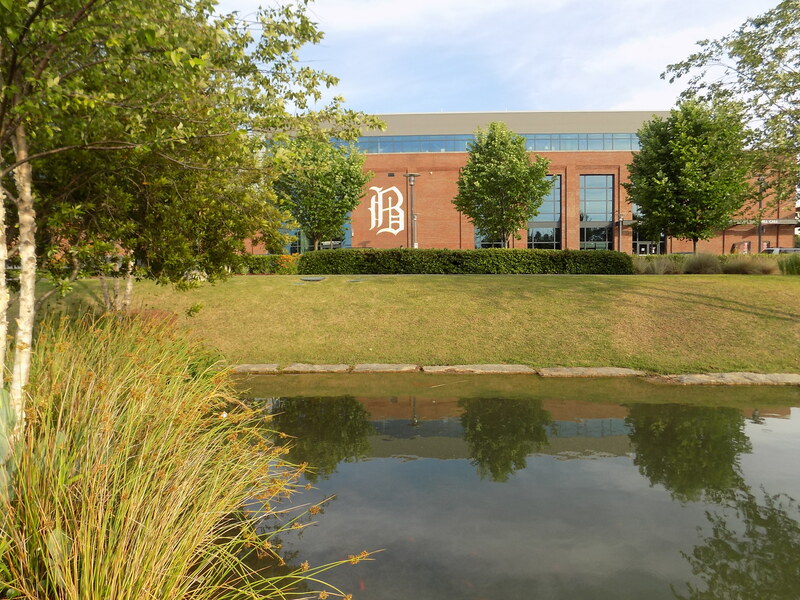 Railroad Park sparked development in that part of Birmingham south of the railroad tracks and now Regions Field, home of the Birmingham Barons baseball team (www.milb.com), is across the street from the park, Restaurants, micro-breweries, shops, apartments, lofts, and condos make the area a populated and busy space with new development all around. A couple of blocks from the eastern edge of Railroad Park, Rotary Trail in the Magic City (www.birminghamrotary.org), a four-block long green space claimed from an abandoned railroad bed, continues the expansion of green space to the former industrial site that is now Sloss Furnaces National Historic Landmark (www.slossfurnaces.com). 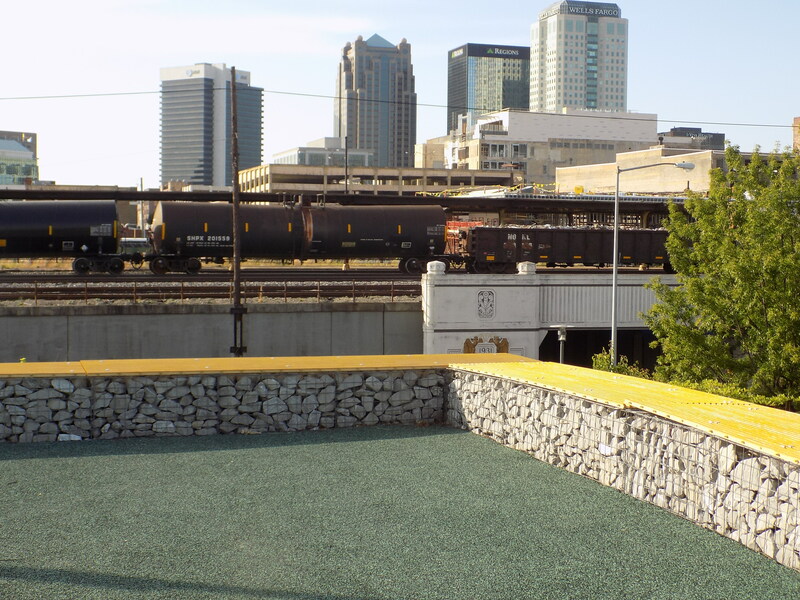 Railroad Park was designed by Tom Leader Studio and was the 2012 winner of the Urban Land Institute’s Urban Open Space Award. Among its competition was New York City’s High Line. An expansive park in the heart of downtown might have sounded like a place nobody would come to a few years ago but now it is always full of people and a great place to stroll or relax, picnic and play. Scattered through the park are descriptions of the city’s industrial heritage and stunning new views of the downtown area. Paths are made of recycled materials and bricks and rocks from the site are used throughout as the bases of benches and platforms. Trains are constantly moving along the tracks in each direction. 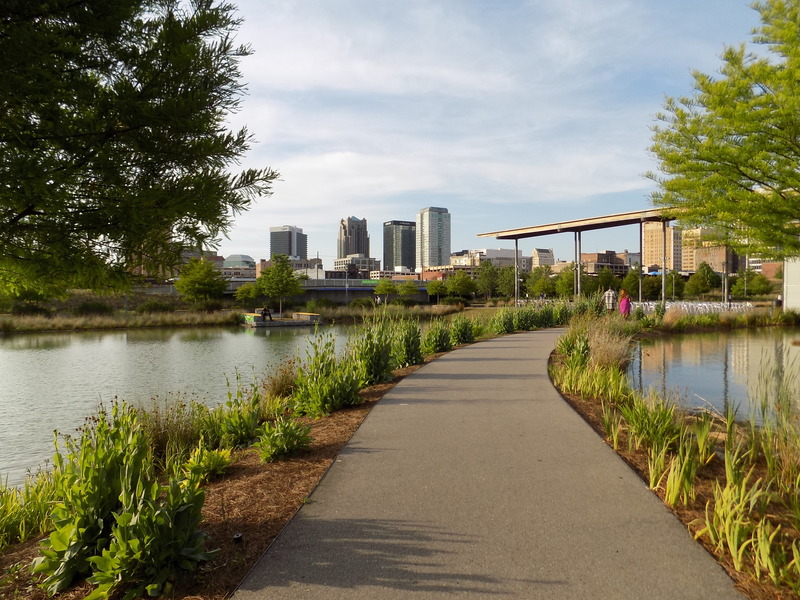 On a recent visit to Railroad Park I saw families celebrating birthdays, people catching a bite to eat, frisbees and sunbathers on the lawn, people walking dogs, a dodgeball game. Many people were just hanging out until time to walk over to Regions Field to catch the Barons game. I restrained myself from starting up a conversation with a young man sitting quietly under a tree and reading The Great Gatsby – just about my favorite novel ever. 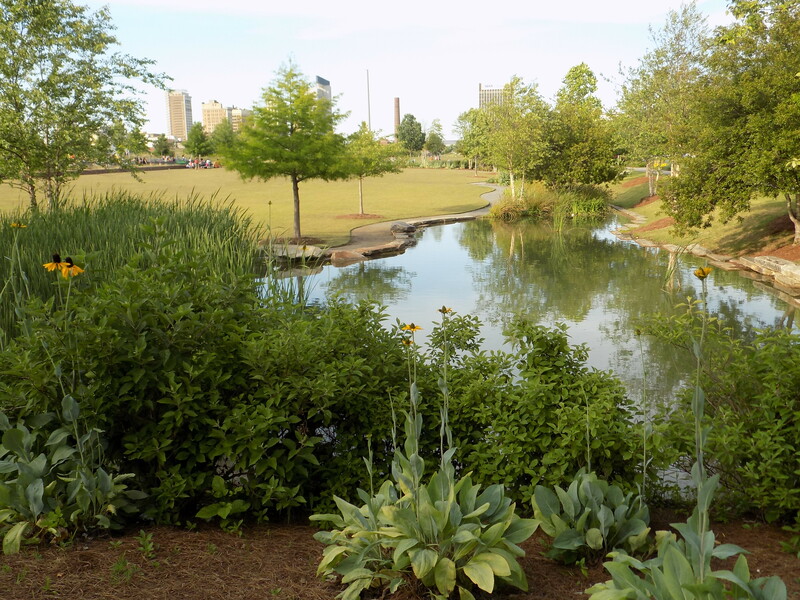 Railroad Park is a relaxing respite in the middle of an increasingly vibrant city center. It is one more example of the city of Birmingham getting it right. There seem to be lots more examples these days. 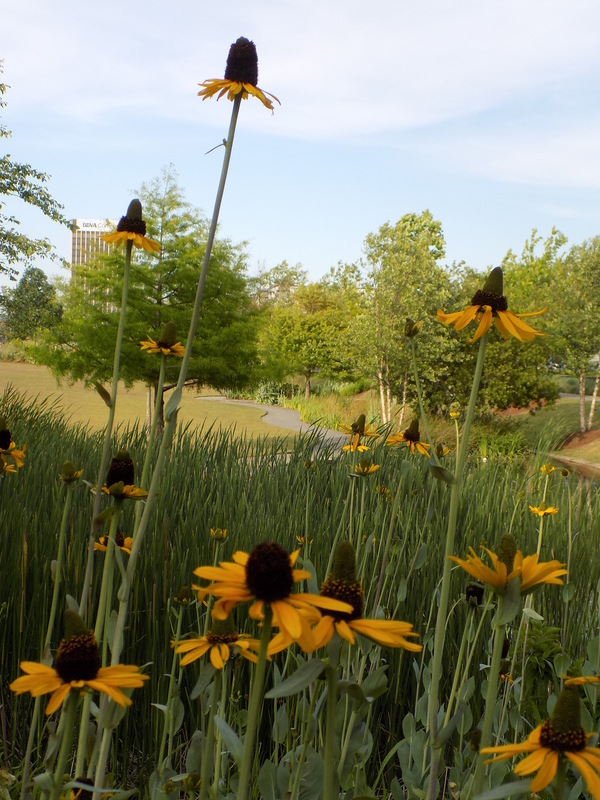 This entry was posted in Birmingham and tagged 2012 Urban Open Space Award, Birmingham Alabama, Birmingham Barons, Railroad Park, Regions Field, Rotary Trail in the Magic City, Sloss Furnaces National Historic Landmark, The High Line, Urban Land Institute on May 19, 2016 by gedwardjourney.